Royal Oak Board members with Montague Matthews at Rayrigg Hall in the Lake District. On September 11, 2018 while on a Royal Oak Board trip to England’s Lake District, the group visited Rayrigg Hall, near Bowness (Windermere). Rayrigg is part Tudor and part Georgian, and the private family home of Mrs. Diana Matthews. 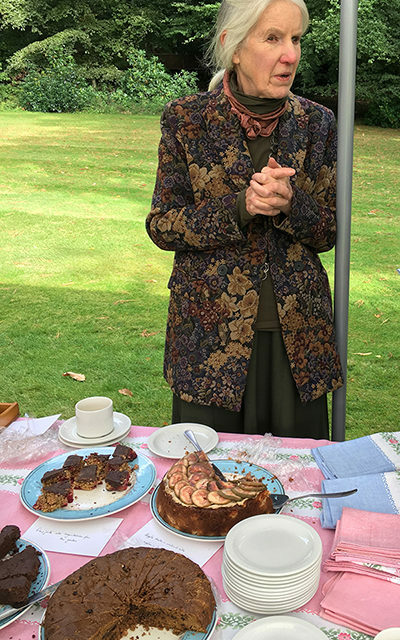 Mrs. Matthews and her son Montague (Monty) toured the group through both the house and gardens before concluding with a cup of tea and cakes under a tent in the front yard. Mrs. Matthews, pictured above, was herself the baker. All present declared the cakes beyond delicious, and that these recipes must be shared if she would agree. Enjoy and happy baking! This is an 18th century recipe stemming from the trade with the West Indies and the Far East. Wool was exported from the west coast of Cumbria for carpet making in exchange for spices, brown sugar, molasses and rum.